O-Wool LEGACY BULKY (100% certified organic merino; 106 yds/97m 100g/3.5 oz); 4 skeins; shown in Raincloud 5626. 9.25 sts and 16 rows = 4” in Seed Stitch. Size US 11 (8 mm) straight needles. Adjust needle size if necessary to obtain the correct gauge. 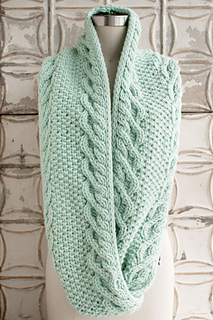 This pattern has an integrated/built-in i-cord edging that is very simple. If you have never done this before, take a deep breath and trust the pattern. If you want more information, do an internet search but please note that “applied” or “attached” i-cord is a different technique. 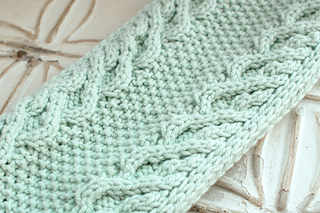 This pattern uses a provisional cast-on to offer the option of joining the ends by either a three-needle bind-off or grafting. 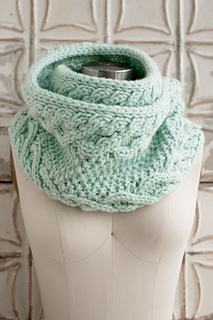 If you would like to keep things more simple and seam yours, or wear it as a scarf and not a cowl, you may use a regular cast-on and bind-off.